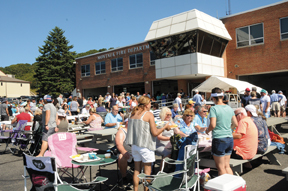 Welcome to this month’s issue of the Montauk Fire Department Corner. I’m sure everyone’s happy to settle into our nice Montauk Autumn weather, and to enjoying it again without the crowds and traffic. 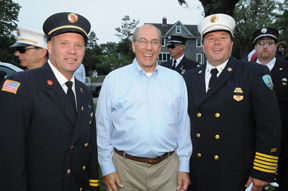 As I am sure you are aware, it was a busy summer for the men and women of the Montauk Fire Department. I want to thank all Members for their commitment to the Department and to our community during the summer months. In particular I’d like to give a shout out to MFD Company No. 4, our Ambulance Company. They have responded to 575 calls for service already this year, and I’m proud to say, without the need to call for assistance from our brother fire departments and/or ambulance squads. I am so proud to serve with such dedicated people. October is a big month in the fire service. It is fire prevention month. This forum gives me a chance to reinforce the need for all homeowners and businesses to check to make sure that your smoke and carbon monoxide detectors are all up and running properly, and that your fire extinguishers are serviced properly and ready for use if needed. It is also a good time to practice a simulated fire drill at your home. Make sure that everyone in the house knows what to do and where to go in case of a fire. Fire Prevention month is also the time that we spend a day at the Montauk Public School with students from Pre-Kindergarten through Eighth Grade, giving them hands-on fire safety instruction. In conjunction with the school we bring several fire trucks and an ambulance to the school and give a lecture and demonstrations to every class. We’ve been doing this for many years and, besides being helpful, it’s a lot of fun. 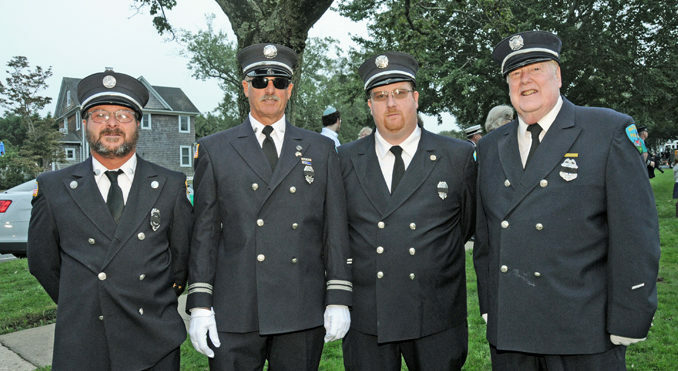 On 9/11 the Montauk Fire Department was more than thrilled to participate in the Memorial at Hook Mill in East Hampton, which was organized by the EastHampton Town Chiefs Association. 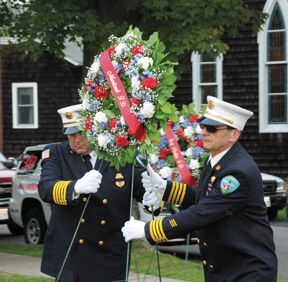 Dutch Riege and I placed the MFD’s commemorative wreath in formation with those of our other Villages. Please see photos here by MFD Honorary Chief Richard Lewin. 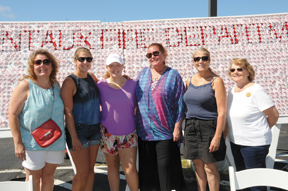 On Sunday, September 16th the Montauk Fire Department held its famous annual Big Bucks Bonanza. It was a beautiful day and was well attended by the public. It is an all hands on deck fund raiser for our Fire Department and I would like to thank all our members who helped out. A special thank you to Eve Lenahan, Rick White and Ed Eurell as chairpersons of this event. There was a lot of money given out that day. 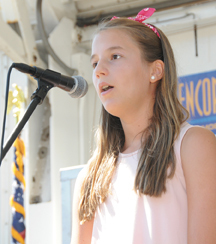 There were thirty $500.00 prizes, twenty five $1,000.00 prizes, and five big prizes. Congratulations to all the winners, and a reminder that 2019 Big Bucks tickets are on sale now. Please enjoy the pictures of the Big Bucks Bonanza furnished by Honorary Chief Richard Lewin. That’s it for this month. Enjoy your Columbus Day weekend and we’ll be back next month to keep you up to date with the Montauk Fire Department.